The Avago ACMD-7410 is a highly miniaturized duplexer designed for use in UMTS Band 2 (1850.48 – 1909.52 MHz UL, 1930.48 – 1989.52 MHz DL) handsets and mobile data terminals. Low Insertion Loss in the Tx channel minimizes current drain from the power amplifier, while low Rx channel Insertion Loss improves receiver sensitivity. The ACMD-7410 enhances the sensitivity and dynamic range of handset receivers by providing high isolation of the transmitted signal from the receiver input and high rejection of transmit-generated noise in the receive band. The ACMD-7410 is designed with Avago Technologies' innovative Film Bulk Acoustic Resonator (FBAR) technology, which makes possible ultra-small, high-Q filters at a fraction of their usual size. The excellent power handling capability of FBAR bulk-mode resonators supports the high output power levels used in mobile communications applications, while adding virtually no distortion. The ACMD-7410 also utilizes Avago Technologies' advanced Microcap bonded-wafer, chip scale packaging technology. This process allows the filters to be assembled into a molded chip-on-board module with an overall size of only 2.0 x 2.5 mm and maximum height of 0.95 mm. 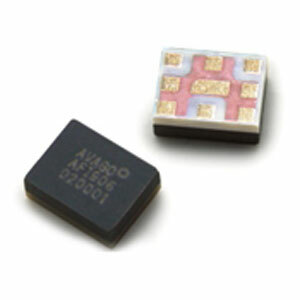 The ACMD-7410 is compatible with standard 2.0 x 2.5 mm duplexer PCB footprints. UMTS and NCDMA Handsets or data terminals operating in the Band 2 frequency range.